Digital transformation is top of the agenda at banks and insurers across the globe. And operational excellence and cost efficiency are the key themes; moving traditional banking and insurance to the digital world: digitalizing processes and optimizing operations. Cost reduction is absolutely necessary; no doubt about that. But many banks and insurers see the digitalization of processes as the end result. All these efforts are really just bringing the basics up to date. What they do is restoring the past; they are not creating the future. The financial services industry is in a new phase. Banks and insurers have to operate much closer to the market. Digital technologies and changing customer behavior are changing the fundamentals of the industry; too fundamental to be solved by cost focus alone. 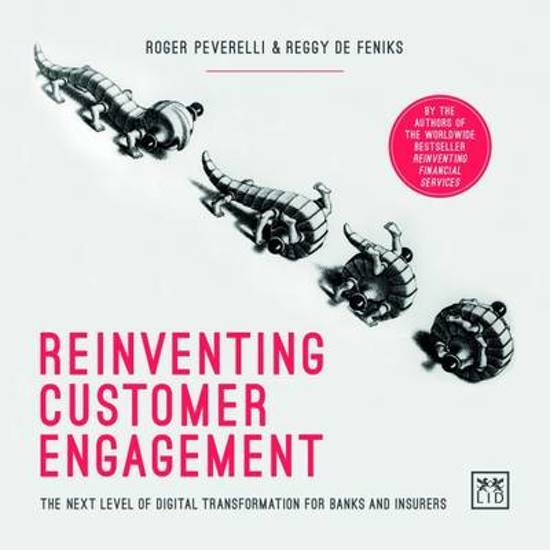 In Reinventing Customer Engagement bestselling authors Roger Peverelli and Reggy de Feniks introduce a practical set of guiding principles to help bankers and insurers make the next leap and close the gap between ‘digital transformation to restore the past’ and ‘digital transformation to create a future’: • How can financial institutions deploy technology to not only reduce costs and solve basic frictions, but simultaneously to lift customer engagement to a dramatically higher level? • What engagement strategies fit best with new customer behaviour? • What new forms of customer engagement are made possible by new technologies? • How can banks and insurers use new engagement strategies to open new revenue streams and create a next level of business models? The next level of digital transformation is about reinventing customer engagement to create more and new value for customers as well as for financial institutions. With more than 200 best practices Reinventing Customer Engagement will spark loads of new ideas. A must read for anyone working in the financial sector. Een must-read voor wie in de verzekering- of banksector werkt om je aan het denken te zetten en je te laten inspireren!